Few industries have more rigorous requirements for precision manufacturing than the military and aerospace markets, and even fewer precision machining providers can meet those high standards. Aircraft and military machined parts must meet critical tolerances to ensure proper performance, as a variation of just a few thousandths of an inch can lead to equipment failure or worse. Portland Precision has the experience and the expertise to meet even the most demanding military and aerospace industry machining standards. We are ITAR registered, AS9100:D and ISO 9001:2015 certified. Request a quote on precision machining for your parts and components, or contact us for more information. With a wide range of precision machining capabilities, in-house secondary services, and more, Portland Precision is a single-source provider who can take your military or aerospace industry machining project from start to finish. We can use your completed CAD/CAM designs, or our engineering team can work with you to develop a finalized design that meets your unique requirements for fit, form, and function. Our advanced CNC machining and turning technology enables us to deliver aircraft or military machined parts that meet your exact specifications. Whether you need a simple 2D aircraft part or a complex 5 axis precision machined military part, Portland Precision can deliver, with close tolerances of ±0.0005” or better and perfect repeatability from the first piece to the last. Our high speed, high precision prototyping capabilities will help you test your parts and make the design adjustments you need to achieve perfect performance. You can take your designs through multiple iterations quickly, and, once you’ve reached your final design, we can easily transition your product into full production, whether you need a few dozen pieces or several thousand. Portland Precision offers a full range of secondary services to give you more complete aerospace or military machined parts faster, at lower cost, and with fewer headaches. With surface grinding and bead blasting to plating and anodizing to assembly and more options available, we can deliver better quality parts that are ready to use (or as close to it as possible). 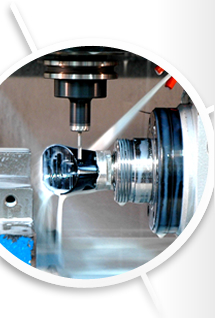 We provide high precision machining for a broad range of metals, alloys, and standard and exotic plastic materials. Our materials expertise enables us to work with titanium, Ultem, aluminum, and other materials preferred by aerospace and military OEMs. No matter what type of standard or specialty material your application requires, Portland Precision can produce high quality, tight tolerance parts that perfectly match your design specifications. For more than 50 years, we’ve built our reputation on the quality of our precision machined parts. Our commitment to quality encompasses every step of your project, from the first purchase order through final delivery. Using state-of-the-art inspection equipment, our dedicated quality control team performs customer-driven inspection processes to ensure that all aircraft and military machined parts meet the customers’ dimensional requirements. We provide versatile, low cost, high precision machining for military and aerospace manufacturers. If you need tight tolerance, premium quality aerospace/military machined parts, you need Portland Precision. Request a quote or contact us to get started on your project.